〈人・動物が〉死ぬ; 〈植物・花が〉枯れる 《★【類語】 die は死ぬの意の最も一般的な語; pass away [on] は die の婉曲語; decease も同様に婉曲語だが法律用語としても用いられる; perish は外部から暴力を加えられたり飢え・寒さ・火事などで災難にあって死ぬ》. die for love [one's country] 愛[国]に殉じる. die at one's post 職に殉じる. die in battle [an accident] 戦死する[事故で死ぬ] 《★【比較】 be killed のほうが一般的》. His father died in 1960. 彼の父は 1960 年になくなった. The old man is dying. その老人は死にかけている. The flowers have died. 花は枯れた 《★【用法】 完了形で用いる時には継続の意はなく (cf. dead 形容詞 1b), 完了の意のみ》. I could have died , it was so funny. 死にそうなほどだった, それくらいおかしかった. 〔+前置詞+(代)名詞〕〔…で〕死ぬ 〔of，from，by〕《★【用法】 通例 die of は病気・飢え・老齢などにより，die from は外傷・不注意に起因する死を示すが，後の場合でも of を用いることが多い》. Mr. Black died of pneumonia today in (the) hospital. ブラックさんはきょう肺炎のため病院でなくなられました. She died from overwork. 彼女は過労で死んだ. He died by violence. 彼は非業の死を遂げた. He died by his own hand. 彼は自殺した. He was born poor and died poor [but died rich]. 彼は貧乏な家に生まれたが死ぬ時も貧しかった[死ぬ時には金持ちだった]. He died a beggar. 彼はこじきをして死んだ. Her memory will never die. 彼女の思い出は決して消えることはないであろう. Don't let the fire die. 火を絶やすな 《★【比較】 この意味では DIE１ out [down] 【成句】 のほうが一般的》. The secret died with him. その秘密は彼の死とともに葬られた, 彼は死ぬまでその秘密を守り通した. I'm dying for a drink. 一杯やりたくてたまらない. She's dying to go on the stage. 彼女はしきりに俳優になりたがっている. He died the death of a hero [died a glorious death]. 英雄らしい(りっぱな)死を遂げた[華々しい死に方をした]. 可算名詞 さいころ，さい 《★次の句以外は通例 dice を用いる》. The die is cast. さいは投げられた (⇒Rubicon). My grandfather died in 1997. She watched her cigarette die in the ashtray. The custom of earth burial is dying. He was dying for a drink. Everyone is dying to meet the movie star. He died a peaceful death. Her husband died suddenly last week. From Middle English deyen, from 古期英語 dīġan, dīeġan (“to die”) and Old Norse deyja (“to die, pass away”), both from Proto-Germanic *dawjaną (“to die”) (compare Danish かつ Norwegian Bokmål dø, Norwegian Nynorsk døy, Low German döen, Middle Dutch doyen, douwen, Old High German touwen), from Proto-Indo-European *dʰew- (“to pass away; to die”) (compare Old Norse dá (“catalepsy”), Old Irish díth (“end, death”), Old Church Slavonic давити (daviti, “to strangle”), Albanian vdes (“to die”), vdekje (“death”), Armenian դի (di, “corpse”), Avestan 𐬛𐬎𐬎𐬀𐬌𐬛𐬍‎ (duuaidī, “we press”)).. Displaced 古期英語 sweltan and partially displaced 古期英語 steorfan (whence Modern English starve). (of a stand-up comedian または a joke) To fail to evoke laughter from the audience. 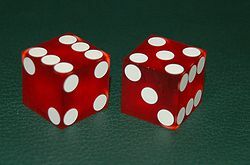 (electronics) (複数形 also dice) An oblong chip fractured from a semiconductor wafer engineered to perform as an independent device or integrated circuit. (electronics) (複数形 also dies) An oblong chip fractured from a semiconductor wafer engineered to perform as an independent device or integrated circuit. D.I.E. or Death Investigation Extension (Traditional Chinese: 古靈精探) is a TVB modern comedy-action series broadcast in March 2008.